Made up of soldiers with small land grants, 'pronoiai', these cavalrymen are a type of reservist who are called up in times of need. 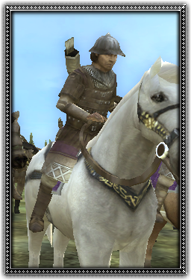 Although armed with bows, they are not as mobile as the Turkish cavalry they often face. However, they are better armoured and much more capable in close combat, making them very versatile. They wear padded or mail armour and are equipped with a composite bow and sword. Originally armoured with the padded kabadion (gambison) and either klibanion (lamellar) or lorikion (hauberjon - mail or scale) and armed with bow, sword and mace, they formed around 40% of the line cavalry.